Garage household chemicals and automotive related products are often some of the most flammable, toxic, carcinogenic, and environmentally hazardous chemical sources found in the average home. Lower down this page is a list of Garage Household Chemicals and products commonly used throughout your home and often stored in the garage. Most of the household products found in the garage are full of hazardous substances that can contribute to serious indoor air pollution and environmental damage. If you have any of these products inside your house or garage, I strongly recommend you first read the label closely for safe storage, disposal, and usage instructions. Then start thinking about how you can greatly reduce your use of all these chemical products. Ventilation and the best home air purifier can reduce volatile organic compounds (such as from paint) which results from off-gasing in areas in the home where many of these garage household chemicals are ultimately used. However, source reduction or elimination (where practical) will always be the most effective method to reduce your exposure to these chemicals at home. If you must use them you should give serious consideration toward isolating the following products from your living spaces and areas adjacent to living spaces such as the garage. Did you know that toxic fumes from various sources can become very concentrated in an attached garage, and they can eventually diffuse into the adjacent living spaces? Walls, floors, and ceilings will in many cases NOT stop these gaseous air pollutants from entering your living space. Some of the most common indoor air pollutants originating from garages are organic solvents such as Xylene and Toluene off-gased from paint cans or paint residues. These can do a great deal of damage to human health with even low levels of exposure over time. Other common hazards are volatile organic compounds off-gased from vehicle interiors, Benzene from Gasoline, and carbon monoxide gas that results from any type of combustion equipment such as vehicles, gas grills, kerosene heaters, or gasoline generators. Carbon Monoxide is colorless, odorless, and it has killed many unsuspecting homeowners. When doors are open or when atmospheric pressure changes, these toxic airborne chemical fumes can pass from the garage and into the home. Some houses have significant negative pressures inside as a result of the HVAC system or due to the "chimney effect" which can result in fumes from the garage being pulled indoors through walls, around doors, or from the shared attic space. Chemicals entering the home from attached garages have been implicated in many cases of Sick Building Syndrome and can greatly aggravate allergy symptoms. 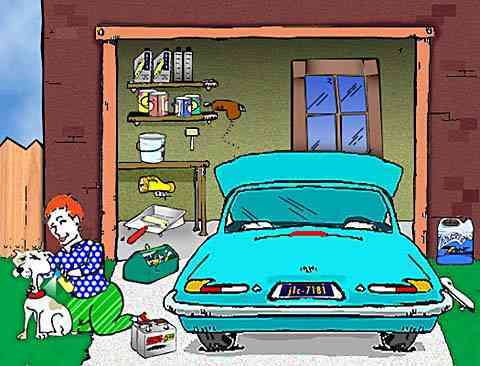 Garages should be properly ventilated when possible. Combustion engines or other fuel burning devices or equipment should NEVER be operated for extended periods of time in the garage (even with the garage door open). And all household chemicals and fuel-containing equipment should be stored in an outside area which is completely detached from the home. Lawnmowers, blowers, weedeaters, chainsaws, pesticides, paints, garden chemicals, and anything else that will give off any sort of chemical vapors should be stored in a properly ventilated outside storage shed that is completely separate from the living space of a home. For Material Safety Data Sheet information for certain brands of products please read the product label to identify the specific chemical ingredients or the manufacturers contact information. Or you may consult our extensive Household Product Manufacturer Directory which has contact information for the 354 major manufacturers and lists showing which of over 6,000 household chemical products each makes. How Healthy is the Air in Your Garage? Car or Small Engine Exhaust - Sources of carbon monoxide and combustion by-products. Remedy: Never leave vehicles, lawn mowers, snow mobiles, etc. running in the garage -- even with the garage door open. Paint, Solvents and Cleaning Supplies - May release harmful vapors. Remedy: Provide ventilation when using. Follow manufacturer's directions. Buy limited quantities. If products contain methylene chloride (e.g. paint strippers), use outdoors. Reseal containers well. Keep products in original labeled containers. Clean brushes and other materials outside. Pesticides/Fertilizers - Toxic yard and garden chemicals. Remedy: Use nonchemical methods when possible. Follow manufacturer's directions for mixing, applying, storage and use protective clothing. Mix or dilute outdoors. Provide ventilation when using indoors. Store products in original labeled container out of home. Remove shoes and clean hands and clothing to avoid spreading chemicals. Call EPA at 1-800-858-PEST for more information. Stored Fuels - e.g., gasoline, kerosene. Remedy: Buy limited quantities. Use properly labeled and well-sealed containers designed for fuels. Do not store inside home. Store in well-ventilated area. - Aerosol sprays (e.g., furniture polish, deodorant, and air freshener) contain an active ingredient and a liquid or gaseous propellant that is packed under at least 40 pounds of pressure per square inch. These pressurized aerosol containers are explosive and may be flammable. The actual product propelled by the aerosol, such as some oven cleaners, can be corrosive or poisonous, therefore requiring great care. Aerosol sprays should be used with care. The fine particles emitted from aerosol sprays are easily breathed deeply into the lungs and quickly absorbed into the bloodstream. Thus, a chemical that is harmless to your skin may become extremelydangerous if inhaled as a mist. - The ingredients in all-purpose cleaners are a combination of detergents, grease cutting agents, and possiblysolvents and disinfectants. These products may contain one or more of the following hazardous ingredients: Ammonia, ethylene glycol monobutyl acetate, sodium hypochlorite, and trisodium phosphate. Depending upon the ingredients contained in the particular cleaner, they can be mildly to extremely irritating to the skin, eyes, nose, and throat, and corrosive if swallowed.Chronic irritation may occur from repeated use. Do not mix ammonia-based cleaners with bleach-based cleaners. Hazardous fumes will result! Cleaners that contain phosphates present awater pollution hazard. - Many aluminum cleaners contain Hydrofluoric acid which is extremely corrosive and toxic. Hydrofluoric acid is extremely dangerous and in high concentrations skin contact with it may even be LETHAL! Upon contact, it destroys the flesh down to the bone as the fluoride ion continues to act until it is neutralized by a calcium store. The pain from burns may be delayed for several minutes to several hours, depending upon concentration. During this time, the acid in the aluminum cleaner can burn deeply into the tissue, causing severe burns and possible damage to muscles, ligaments, and bone. Low concentrations in the eyes can cause intense irritation; high concentrations, immediate blindness. - The primary danger associated with ammunition is accidental discharge, especially when children of any age view ammunition as something to play with. For example, pounding on a bullet with a hammer to break it open and see what is inside or throwing ammunition into a fire can lead to accidental discharge. - Antifreeze is a syrupy liquid that is usually bright yellow or green and is the garage household chemicals which may cause the majority of cases of household chemical poisoning. It is used in radiators and windshield cleaners for cars and trucks to keep liquids from freezing. Antifreeze contains Ethylene Glycol which is poisonous when ingested. Ingestion may result in depression followed by respiratory and cardiac failure, kidney damage and brain damage. Manufacturers of antifreeze are required to clearly post dangers on the label and provide a childproof cap, which minimizes the danger of accidental ingestion by children. However, antifreeze when improperly disposed of can endanger the health of pets. Each year, thousands of dogs and cats are poisoned by discarded or leaking antifreeze. The sweet taste of antifreeze attracts pets who lap up puddles of antifreeze they find. To prevent this danger, wash down or absorb puddles of antifreeze with an absorbent material such as kitty litter and dispose of the absorbent in the trash. - Asbestos is a naturally occurring group of minerals that are flexible, fire resistant, and virtually indestructible.Many hundreds of products contain asbestos fibers.Some general categories are insulation, asbestos cements, fireproofing, fireproof clothing, floor tiles, pipes, brake and clutch linings, pot holders, ironing board pads, hair dryers, and textured paint. In the recent past, some uses have been banned: spraying asbestos-containing materials (1973); certain pipe coverings (1975); some patching compounds and artificial fireplace logs (1977); spray-on asbestos decorations (1978); and hair dryers containing asbestos (1979). In most products, asbestos is combined with a bindingmaterial. However, if the tiny asbestos fibers do becomeairborne and inhaled, they can remain in the lungs andmay cause severe health problems that do not appearuntil many years later. There is no known safe exposurelevel to asbestos. Asbestos toxicity surfaces only after along latent period. The respiratory tract is the usual target organ. Asbestosis and asbestos-related cancers such as Mesotheliomaare the two main categories of asbestos disease. - In the paving and roofing trades, a tar or asphalt is applied in a hot liquid form that cools into a semi-solidcovering. Asphalt is a residue of petroleum refining. Taris produced by distillation of coal, oil, lignite, peat, orwood. Inhalation of hot asphalt fumes can cause eye andrespiratory tract irritation, headaches, nausea, andnervousness. Skin exposure to hot tar can cause seriousburns. Wear protective gloves. - Automobile, boats, and tractor batteries are wet cellbatteries which contain Lead and a solution of sulfuricacid. When activated, the electrolyte solution in thebattery produces explosive gases which are easilyignited. Manufacturers of batteries containing SulfuricAcid must use labels which warn consumers of thedangers from battery acid and accumulated gases.Sulfuric acid is extremely caustic. Fumes are stronglyirritating, and contact can cause burning and charring ofthe skin; it is exceedingly dangerous to eyes. Lead ispoisonous in all forms and accumulates in our bodiesand in the environment. - Carbon monoxide is a colorless gas which is practicallyodorless, tasteless, and non-irritating. Carbon monoxideis always formed when a fuel containing carbon is inadequately burned with poor ventilation. Kerosene, charcoal, coal, wood stoves, and automobile exhaust fumes are common sources of carbon monoxide poisoning. Natural gas in theUnited States does not contain carbon monoxide, but it may form if the gas is burned without adequate air supplies. Carbon monoxide starves the body and brain of oxygen. Carbon monoxide poisoning produces symptomsranging from headache, dizziness, flushed skin, disorientation,troubled thinking, abnormal reflexes, shortness of breath,fainting, and convulsions, to coma and even death. Heartproblems are also aggravated by the presence of carbonmonoxide because the heart must pump harder. Children,persons with respiratory illness or anemia, and the agedmay be particularly sensitive. Chronic exposure to low carbon monoxide levels impairs judgement and increasesthe time required to make decisions. Never leave vehicles, lawn mowers, snow mobiles, etc. running in the garage -- even with the garage door open. Many people died during hurricane Katrina and Rita due to carbon monoxide poisoning after running their gas powered generators indoors. - Glues, rubber cement, epoxy, and other adhesivescontain a solvent such as Xylene or Toluene which, when applied, evaporates out leaving the solid adhesive portion behind. Rubber cement, epoxy, instant glues, model glues, and plasticadhesives contains five dangerous solvents. Many adhesivesare extremely flammable. Some adhesives are skin andlung irritants and allergy-sensitizers while others cancause burns to skin and eyes. Many of the solvents usedin adhesives and glues have narcotic, possibly fatal,effects when inhaled in high concentrations. Inhalation offumes from cured epoxy resins may result in coughingand bronchial spasms for several days. - The typical paint mixture is 5-25% pigment and 75-95% solvent. The type ofpigment and solvent used largely defines the toxicity of the paint. Paints may become hazardous if fumes are inhaled or if paint is ingested. Another hazard associated with some paints is flammability. The label should state whether or not the paint you are using is flammable. With the exception of latex paint, which has water as a solvent, solvents commonly used in paints include mineral spirits (naphtha), Xylene, Toluene, and other petroleum distillate solvents. These solvents can irritate your eyes, skin, and lungs. Inhaling paint fumes can result in headaches, nausea, dizziness, and fatigue. Toxic fumes can accumulate in closed spaces and areas with poor ventilation. Acute and chronic symptoms include muscle weakness, liver and kidney damage, and respiratory problems. Due to the high solvent content of oil-based paints and varnishes, women should avoid using these products while pregnant. - Turpentine and mineral spirits are commonly used in thinning paints and varnishes. Both ingredients are flammable and toxic, though mineral spirits are of lower toxicity. Mineral spirits, a petroleum distillate, can be harmful through inhalation, skin and eye contact, and ingestion. Contact and inhalation can cause eye, nose, and throat irritation, dizziness, and dermatitis. Ingestion can induce central nervous system depression. Damage to lungs may result if mineral spirits are swallowed and then vomited. - There are a variety of different formulations for products that remove paint and varnish (also called paint and varnish strippers). Most paint and varnish removerscontain organic solvents which are hazardous to humanhealth. Most paint and varnish related garage household chemicals are highly flammable. Some non-flammable products will produce a toxic gas when in contact withflame. Paint and varnish removers may contain some of these hazardous ingredients: Acetone, Benzene,isopropyl alcohol, methanol, methylene chloride,petroleum distillates, Toluene, trichloroethane, andXylene. Although not presently used in paint and varnishremovers, Benzene, a known human carcinogen, was aningredient in older products. Hazardous ingredients in paint and varnish removerscan harm your body through skin contact, skin absorption,ingestion, and inhalation. - Plastic is made from fractions of natural gas or crude oil changed chemically into solid form. There are two basic types of plastic: Thermosetting and Thermoplastics. Thermosetting plastics are set to a permanent shape and cannot be softened. These plastics are used primarily for multiple use items, such as dishes and furniture. Thermoplastics are soft when exposed to heat and pressure and harden when cooled. Thermoplastics are the most common type of plastic and are used to make a variety of products. BEWARE #7! Polycarbonate - This type plastic may contain the suspected endocrine disruptor and carcinogen know as Bisphenol-A. In 1995 the CDC found that Bisphenol-A is likely found in 95% of Americans' blood. This is particularly alarming since evidence is mounting in support of the theory that Bisphenol-A is a possible contributor to the rise in Prostate cancer over the last decade. Some examples of products made with polycarbonate plastics are milk containers, water bottles, baby bottles, pacifiers, sippy cups, toys, can liners, food storage containers, dental sealants, plastic eating utensils, and water pipes. No wonder Bisphenol-A is such a common blood contaminant in Americans and why California has already banned many products which may potentially release Bisphenol-A. - There are many chemicals used to balance, sanitize, and clean the water in swimming pools (including hot tubs and spas). The following describes the principal chemical products used to maintain pools. Occasionally, algae will not be controlled by the chlorine sanitizer. A shock treatment of a large amount of chlorine (superchlorination) or a cationic detergent may be added to the water to kill the algae. Alkyl ammonium chlorides are common algacide ingredients. - Be wary of products claiming to clean your septic tank. Many of these products temporarily precipitate solidgiving the illusion of success, but actually they producesolid bulk which is more difficult for bacteria and microorganisms to break down. Many septic tank cleaners alsochange the water's acidity, causing many bacteria to die,Products containing sodium or potassium hydroxide(lye) are highly caustic to humans. They also change theacidity of the water and speed soil clogging. Septic tankcleaners containing organic solvents such as trichloroethyleneshould never be used because they are toxic, take a very long time to break down in the environment, and have been shown to contaminate the ground water. - Smoke detectors are important for early detection of fires. There are two types of smoke detectors: photoelectric, which detects only visible products of combustion, and ionizing, which detects both the visible and invisibleproducts of combustion. Ionizing (or ion chamber) smoke detectors contain a very small amount of radioactive material, Americium-241 (Am-241). Am-241 has a half life of 458 years and emits alpha particles. The ionizing smoke detector is constructed so that to gain access to the radioactive sections would require the complete destruction of the smoke detector. The best way to dispose of an ionizing smoke detector is to return it to the manufacturer. The photoelectric smoke detector can be disposed of in the trash. - A solvent is any substance that dissolves another substance. For example, mineral spirits (a petroleum solvent) dissolves paint. Water, the most common solvent, is an "inorganic" solvent because it does not contain carbon. Many solvents used in the home are organic" solvents. All organic solvents are hazardous! Some of the most common garage household chemicals are toxic because of the many volatile organic solvents they contain. Organic solvents used in household products are hazardous and contain the same ingredients as their industrial and commercial counterparts. Solvents are used in many household products. Products containing almost 100% solvents include paint thinner, furniture stripper, dry-cleaning fluid, spot remover, degreaser, turpentine, and nail polish remover. Products that are composed partially of solvents include furniture oil, glues, aerosol sprays, shoe care products, rug cleaners, and oil-based paints. Solvents can be flammable, toxic,or pose a serious health risk through skin absorption and inhalation. Some health hazards occur immediately. Others, such as liver and kidney problems, birth defects, and nervous disorders, occur slowly over time. For more information about paint solvents visit our complete guide to solvents. - Sulfuric acid, also known as oil of vitriol, hydrogen sulfate, or spirit of sulfur, is available in powder form and as a colorless, odorless, oily liquid. Beware - it is a highly corrosive liquid! Sulfuric acid is used as an electrolyte in wet cell batteries and as an ingredient in toilet bowl cleaners (sodium bisulfate). Direct contact can cause burning and charring of the skin and causes rapid injury to the mucous membranes. It is exceedingly dangerous to the eyes. Exposure to sulfuric acid mist and subsequent inhalation causes irritation of the respiratory tract and mucous membranes including the eyes. The mist also causes etching of tooth enamel. Ingestion results in serious burns to the mouth, esophagus, and stomach. Even dilute sulfuric acid can irritate the skin and mucous membranes and cause scarring of the face and eyelids and irreparable damage to the cornea, resulting in blindness. Did you ever wonder why cutting onions causes burning eyes? Well it's because onions are naturally high in sulfur compounds which when released into the air by cutting allows the sulfur to combine with the water in your eyes producing a weak solution of sulfuric acid and thus the burning and tearing eyes. - Window and glass cleaner commonly contains isopropyl alcohol or Ammonia, water, and coloring. It may be mildly irritating to the eyes, skin, nose, and throat. - Creosote and inorganic arsenic compounds have been shown to cause cancer in humans, pentachlorophenol in lab animals. In addition, creosote (still used to treat railroad crossties or "sleepers") has been linked to genetic damage, inorganic arsenic compounds are related to both genetic damage and birth defects, and pentachlorophenol is associated with birth defects and fetal toxicity. The Environmental Protection Agency strongly suggests that homeowners leave work involving wood preservatives to professionals. If you have a deck, tables, or other furniture that are treated with one of these types of wood preservatives, EPA advises sealing it with at least two coats of shellac or other sealant. Currently when creosote or pentachlorophenol is used on wood intended for human contact, it must be coated with shellac or another sealant. Eliminate as many garage household chemicals as possible from in or around your home. CHEMICAL SOURCE CONTROL IS OUR GOAL!